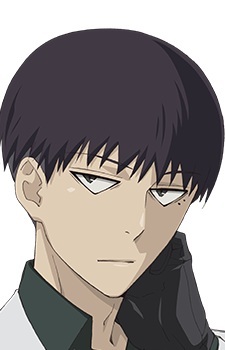 He is a Rank 1 Ghoul Investigator, a Quinx and the former Squad Leader of the Quinx Squad. Urie often displays himself as a cool-headed individual, holding a monotonous facial expression the majority of the time. As a Ghoul Investigator, he appears to be very dedicated and stern about his work, to the point where it may seem as though he is ruthlessly slaughtering more ghouls than necessary, which is a habit he often gets berated for. Urie also tends to be quite hasty when investigating the slightest details or signs of a suspect. He has a tendency to execute mission objectives independently, without awaiting the arrival of his fellow team mates, or even requesting their help. This is because he is an ambitious person, and does not wish to share credit with others, as he merely wishes to achieve higher ranks as a Ghoul Investigator. To achieve his personal goals, he is willing to go as far as manipulating his comrades or cause discord within the team. But beneath his ambition and cool-headed demeanor is an insatiable jealousy towards his superiors particularly Sasaki. Urie believes that ghouls, under any circumstance, must cease to exist. He is a person who is always striving for power and as a result constantly looks for ways to one up everyone around him which is shown by asking Professor Shiba to help augments his kagune's power to presumably to get an edge over Sasaki. Urie believes that as an investigator, he must never retreat and will fight on even if it means to strain himself to the end. This belief stemmed from the fact that his father, a special class investigator in charge of the S3 squad, ordered his team members to retreat while he stayed to fight the One-Eyed Owl to the death. He also holds a grudge against Takeomi Kuroiwa and Iwao, for not fighting by his father's side during the Owl battle; and therefore thinks that they are inconsiderate of his loss. Thus, Urie refuses to forgive them. An omake in volume 1, shows that he is a talented painter.